In this section I would like to profile YOUR tanks!. Please send me your photos with a brief description of the animals and plants as well as any other information you feel is relevant. Include your web site and Email as I will post them with your photos as a link, if you request it. Freshwater or saltwater tanks will be accepted. I have a 29 gallon Eclipse community tank. There are live plants that are growing like crazy. 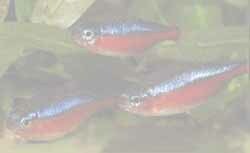 They are Amazon sword and Hydrophilia. As you can see, the hydrophilia will try to take over! I have to prune monthly. I just recently rearranged the plants and removed a lot of excess. I thought I would add to your collection of peoples aquariums, here are 9 Jpg's that I uploaded with my digital camera. My first tank is a 21gal, I have a variety of fish, 2 Angels, 2 keyhole Cichlids, 3 Swordtails (the baby was bread myself), a Pleco, some corys, 1 Rainbow fish, 1 Clownloach, 6 Harlequins, 1 Pencilfish, 1 Pakistani loach. I have had it for about a year, both my angels and swordtails breed frequently, although I've not had any fry from the angels. My other tank is a small 18" tank. I have about 10 baby convict Cichlids that were given to me. I hope to find a suitable pair and breed them. They are very lively fish, sometimes aggressive and great looking. I have three tanks in my house now. 2-20 Gallon and 1-15 Gallon. The picture you see now is of my newest 20Gal. The tank is generously planted with Vallisenaria Giganticus, various crips, Annubias Bateri v. nana, Amazon Swords. The foreground is divided with large pieces of Mopani wood and some common driftwood. I fertilize the plants with a weekly regimen of Kent's plant food that is high in iron to bring out the beauty in the plants. Finally the tank is supplemented by a CO2 system I made from a 2L pop bottle, sugar, yeast and water. The tank is filtered with both an undergravel filter on a 301 Powerhead and a Dynaflo2 basket filter. The inhabitants of the tank include 2- Clown Loaches, 1- Whiptail cat, 1- Bushynosed Pleco, 5- neon tetras and finally the new neighbour is going to be a large Kissing Gourami. The fish are fed with two small feedings a day of flakes and every two or so days the bottom crew get a treat of Spirulina algae discs made by the Hikari company. The tank is pretty self-sufficient needing only to be cleaned once every two to three weeks. I hope you like it. Badman must apologize to the owner of this great fish tank. While updating to Windows 98, I lost some files, including the Email from the owner of this tank. If this is your tank please Email me and give me the tank specifics again and I will get them up ASAP. Once again I am sorry. These are some photos sent to me of a community Discus tank set up. From what I can see this must be one AWESOME tank! Sean I am very envious. Here's a brief run-down of his tanks. Feel free to Email Sean for any questions you might have. 75g tank shows our 75 gallon Discus habitat. We have 5 Discus, a handful of Tetras (they like the acidic water too), and a Pleco. We use a Penguin 330 for filtration along with a Magnum 350 which is packed with peat. (the peat reduces the flow somewhat) We have 2 150 watt submersible heaters (keep it at 84-86 degrees), and a typical gravel bottom. We crammed in as much driftwood as possible and went with plastic plants to keep the tank easier to clean. Note the slate-walled cave at the right side of the tank... (please oh please, go make babies you beautiful wonderful Discus!!!!) As we have very hard very, alkaline water (300 ppm+, 7.6+) in our area I try to change as little water as possible on the tank. For now, I'm doing about 10% weekly and trying to clean the bottom of the tank as well as I can. The "fresh water" that I add is treated with Stresscoat for Chlorine, then pH 6.5 to lower the pH, then a tablespoon of salt per about 5 gallons. We also use a bit of Tetra Blackwater Extract. The color of the tank water is about like iced tea, the fish seem to love it. When we do the 10% change, we also use a water softener pillow for a couple of days to help soften up the water. We are keeping the water around 100-150 ppm (I wish I could get it lower) and at a pH 6.5. Hopefully, over time, the use of peat,driftwood, and the pillow filter will continue to soften it up even more. These are scans of some photos sent to me and which I scanned. When I have time I will try to enhance them. In the tank there is a Jewel power filter, a powerful lite an aerator and a heater. The fish include 2 Corys 2 clown Loach, 6 Black Widow Tetra, 1 Splendid Rainbow 1 Pleco a Synodontis catfish and Pim Pictus catfish. Looks like a nicely set up tank. well done Josh! These are some of the best pictures oy the "true" monsters of the hobby, if your thinking large fish check this site out! this is on of the Wizkid83 10 Gallon planted tanks, It's a great example of a beautifuly aquascaped small aquarium. Check out his site for more information and pictures. If you click on it you can see the full sized version of it. Here is a list of the equipment I use for my tank. These photos were sent to by a reader, please click on the thumbnail for a full size version. His photo library was quite extensive and contained some of the most beautiful pictures of Discus I have seen. I have dedicated a entire galley to showcase them. Please go to the The Discus Gallery. to view these spectacular photos. Ever-So-Slightly is a Monodactylus argenteus, or mono for short. His real name is Slightly-Ever-So. Other names people give him are Fingerfish and Malayan Angel. The largest he can be is 10". He came on a ship from Africa. Mono's have very large eyes, as he does. He will eat just about anything. The following pictures are of some of my tanks I am not a photographer (no kidding) and only have a fixed focus 35mm camera. Click photos for a full size image. These are some pictures of my micro-reef tank. It is 15 gallons and contains Bubble coral, Brain coral, Star polyps, mushrooms, various shrimp, Feather dusters, snails, an Urchin, two starfish, a Dottyback and a Pearl-scale Jawfish. It is a very rewarding tank. My 29 gallon Malawi Cichlid tank. It has P Zebras, A mated pair of Melanochromis Auratus, P. Socolofi and a Synodontis Nigriventris. A very lively tank. A section of my plant tank, there are young Angels and some Flying Foxes visable. The plants are Water sprite and Java moss. The tank is on a stair landing and I cannot get a full view picture.